The demand for antioxidants, especially those from natural sources, classified as GRAS (Generally Recognized As Safe), has grown in recent years. Many studies have shown the possibility of toxic effects attributed to synthetics, resulting in increased natural products market (FRANKEL, 2012; KUMAR et al., 2015). Fruits have presented good sources of antioxidants for industrial application. Vitamins, widely distributed in plants, are incorporated into food as fortifying agents and additives (JIANG; XIONG, 2016). Vitamin C (ascorbic acid) is found in abundance in many fruits, such as lemon, orange, tomato and acerola (BARTOSZ, 2014). Ascorbic acid is a hydro-soluble vitamin with antioxidant action, being a strong reducing agent and scavenger of reactive oxygen species (ROS) and other free radicals (FRANKEL, 2012). Among the main benefits of Vitamin C in vivo is the increase of body’s defense functions in infection diseases and allergic reactions (IQBAL; KHATTAK, 2004). Due to its high antioxidant capacity, it promotes the inactivation of free radicals, directly related to the aging process and diseases such as cancer and cardiovascular disorders (NUNES et al., 2011). In diabetes, it has a modulating action of insulin, contributing to glycemic control (ARANHA et al., 2004). At the cardiovascular level, it improves the vasomotor capacity of coronary arteries in patients with hypertension and ischemic heart diseases, decreases arterial hardening and platelet aggregation and reduces atherogenesis (MULLAN et al., 2002). Another important function of ascorbic acid is related to the synthesis of collagen, proteoglycans and other organic constituents of the extracellular matrix in several tissues, such as the teeth, bones and capillary endothelium (MANELA-AZULAY et al., 2006). The term vitamin C is a generic description for all compounds that exhibit biological activity of ascorbic acid. The main natural compound with antioxidant and Vitamin C activity is L-ascorbic acid, found in plants and mammals. Ascorbic acid may have two enantiomeric pairs (L- and D-ascorbic acid and L- and D-isoascorbic acid), whereas D-ascorbic acid and L-isoascorbic acid are not found in nature. D-isoascorbic acid, also known as erythorbic acid, is not found in nature and has about 5% of vitamin activity when compared to L-ascorbic acid, and has similar antioxidant properties (BALL, 2006; ZORN; CZERMAK, 2014). Meat products are susceptible to chemical and microbiological degradations due to their rich nutritional composition. Lipid oxidation, the most common deterioration observed in meat products and responsible for the development of rancidity is a complex process, related to the chemical composition of product, exposure to light, oxygen and temperature (FRANKEL, 2012; SHAH; DON- BOSCO, MIR, 2014). Brazilian legislation (MAPA normative Instruction no. 51 of 12/29/2006) authorizes the application of antioxidants in meat products, and regulates the use of additives and their limits in technological processes. According IN 51/2006, vitamin C or ascorbic acid is allowed to be used in quantities sufficient to obtain the technological effects in the following categories: frescal products inlaid or not; dried, cured and / or matured products; cooked products inlaid or not; raw salted products; cooked salted products; canned meat, mixed; and semi-preserved meats. This additive has the function of delaying the appearance of oxidative alterations. Lipid oxidation in meat can be effectively controlled by the addition of antioxidant agents with several mechanisms of action, among them, removal or inactivation of free radicals through the donation of hydrogen atoms (phenolic compounds), free radical stabilization by resonance (BHT, BHA, tocopherols), ROS scavengers and synergists (ascorbic acid) (SHAH; DON-BOSCO; MIR, 2014). Currently emulsified meat products are produced employing sodium erythorbate as antioxidant and accelerator of healing reactions (interaction of nitrites with the meat myoglobin). Sodium erythorbate is the sodium salt of erythorbic acid (D-isoascorbic acid) and does not confer health benefits for consumers, because does not have vitamin activity (COMUNIAN et al., 2014). 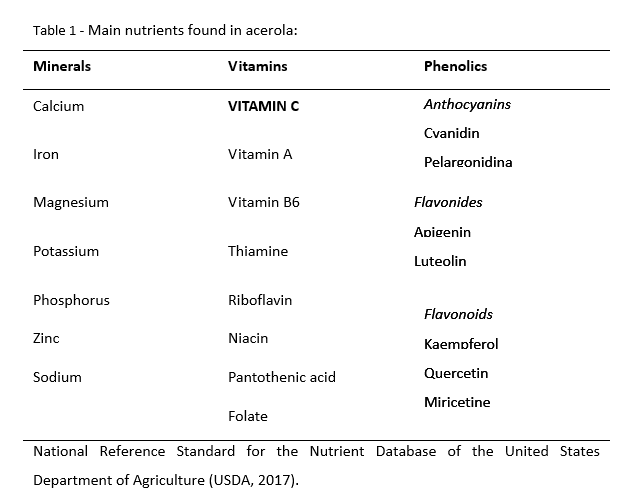 Acerola (Malpighia emarginata) is known as one of the major natural sources of L-ascorbic acid (Vitamin C) and several other nutrients (Table 1), making it attractive and increasingly popular in the human diet (MATTA et al., 2004; MEZADRI et al., 2006). Acerola can be found in southern Texas, Mexico and Central to South America and throughout the Caribbean (ASSIS et al., 2008). At the commercial level, acerola is currently cultivated in Puerto Rico, Hawaii, Jamaica and Brazil. Brazil today stands out as the largest producer, consumer and exporter of the fruit, with the cultivation reaching around 10,000 ha. Recent data point to the Northeast and Southeast regions as the largest producers, with around 70% and 15% of production respectively (FURLANETO and NASSER, 2015). Market demand for acerola fruit has increased significantly in recent years, not only in the food sector of natural products, but also as a source of ascorbic acid for pharmaceuticals purposes, due its potential biological effects attributed to the high Vitamin C content and presence of phenolic compounds (ASSIS et al., 2008). Acerola products have been increasingly used in the composition of many other products such as beverages, dairy foods, cereal bars, fillings, food supplements and also for the fortifying juices and nectars of other fruits such as pineapple, papaya and passion fruit. In addition, it acts as an efficient antioxidant protecting the flavor and color of many processed foods. Recent studies have pointed ascorbic acid as an efficient antioxidant when applied in meat products (AYALA-ARMIJOS et al., 2016; COMMUNIAN et al., 2014). In this area of application, acerola stands out as a safe antioxidant additive (MATOS-JUNIOR et al., 2015) that provides benefits to consumers as source of L-ascorbic acid (100% of vitamin C activity). Understand the needs of consumers and deliver exactly what they are looking for, enabling the transforming of new demands and market trends into successful products. This is the goal of Duas Rodas with this efficient natural antioxidant solution from the acerola fruit. Therefore, more than an ingredient, we enable the exploration of “natural benefits” and demands transforming into business opportunities. Manufacturers can increasingly promote their “actual fruit content”, their equivalence in terms of portion of fruit, as well as indicate the “source of vitamin or nutrient” in their products, delivering to consumers healthier, quality products. ARANHA, F.Q. ; MOURA, L.S.A. ; SIMÕES, M.O.S. ; BARROS, Z.F. ; QUIRINO, I.V.L. ; METRI, J.C.; BARROS, J.C. Normalização dos níveis séricos de ácido ascórbico por suplementação com suco de acerola (Malpighia glabra L.) ou farmacológica em idosos institucionalizados. Revista de nutrição, v. 17, n.3, p.309-317, 2004. ASSIS, S. A.; PEDRO-FERNANDES, F.; MARTINS, A. B. G.; O. M. M. FARIA-OLIVEIRA. 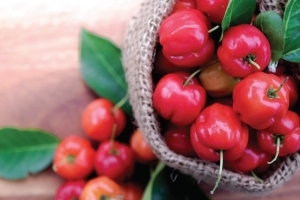 Acerola: importance, culture conditions, production and biochemical aspects. Fruits, v. 63, n. 2, p. 93-10, 2008. AYALA-ARMIJOS, H.; GONZÁLEZ, G. G.; SÁNCHEZ-PRADO, R.; JIRÓN-VELEZ, Y.; ESPINOZA-RAMÓN, W. Efecto de la adición de ácido ascórbico en la degradación de nitratos y nitritos en mortadela. Revista Ciencia UNEMI, v. 9, n. 20, p. 85 – 92, 2016. BALL, G. F. M. BALL, 2006. Vitamins In Foods: Analysis, Bioavailability, and Stability, CRC Press, 2006, 814 p.
BARTOSZ, G. Food Oxidants and Antioxidants Chemical, Biological, and Functional Properties, CRC Press, 2014, 570 p.
COMUNIAN, T. A.; THOMAZINI, M.; GAMBAGORTE, V. F.; TRINDADE, M. A.; FAVARO-TRINDADE, C. S. Effect of incorporating free or encapsulated ascorbicacid in chicken frankfurters on physicochemical and sensory stability. Journal of Food Science and Engineering, v.4, p. 167-175, 2014. FRANKEL, E. N. Antioxidants in food and biology: Facts and fiction. 2 ed., 2012, 265 p.
FURLANETO, F. P. B.; NASSER, M. D. Panorama da cultura da acerola no estado de São Paulo. Pesquisa & Tecnologia, v. 12, n. 1, 2015. IQBAL, K.; KHAN, A.; KHATTAK, M. A. K. Biological significance of ascorbic acid (vitamin c) in human health – a review. Pakistan Journal of Nutrition, v. 3, n. 1, p. 5-13, 2004. JIANG, J.; XIONG, Y. L. Natural antioxidants as food and feed additives to promote health benefits and quality of meat products: A review. Meat Science, v. 120, p.107–117, 2016. KUMAR, Y.; YADAV, D. N.; AHMAD, T.; NARSAIAH, K. Recent Trends in the Use of Natural Antioxidants for Meat and Meat Products Comprehensive. Reviews in Food Science and Food Safety , v.14, p. 796 – 812, 2015. MANELA-AZULAY, M.; MANDARIM-DE-LACERDA, C. A.; PEREZ, M. A.; FILGUEIRA, A. L.; CUZZI, T. Vitamina C. Anais brasileiros de dermatologia, Rio de Janeiro, 78(3):265-274, maio/jun. 2003. MATTA, V.M. ; MORETTI, V.M. ; CABRAL, L.M.C. Microfiltration and reverse osmosis for clarification and concentration of acerola juice. Journal of Food Engineering, v. 61, p. 477–482, 2004. MATOS-JUNIOR, F. E.; THOMAZINI, M.; TRINDADE, M. A.; FÁVARO-TRINDADE, C. S. Aplicação de vitamina C livre e encapsulada por spray chilling em salsicha de carne de frango: características físico-químicas, estabilidade e aceitação sensorial. Brazilian Journal of Food Technology, v. 18, n. 4, p. 322-331, 2015. MEZADRI, T.; FERNÁNDEZ-PACHÓN, M. S.; VILLANO, D.; GARCIÁ-PARRILLA, M. C.; TRONCOSO, A. M. The acerola fruit: composition, productive characteristics and economic importance. Archivos Latinoamericanos de Nutrición, v. 56, n. 2, p. 101–109, 2006. MULLAN, B.A. ; YOUNG, I.S. ; FEE,H. ; McCANCE, D.R. ; Ascorbic acid reduces blood pressure and arterial stiffness in type 2 diabetes. Hypertension, v.40, p.804-809, 2002. NUNES, R.S. ; KAHL, V.F.S. ; SARMENTO, M.S. ; RICHTER, M.F. ; COSTA-LOTUFO, L.V. ; RODRIGUES, F.A. ; ABIN-CARRIQUIRY, J.A. ; MARTINEZ, M.M. ; FERRONATTO, S.; FERRAZ, A.B. ; DA SILVA, J. Antigenotoxicity and antioxidant activity of acerola fruit (Malpighia glabra L.) at two stages of ripeness. Plant Foods for Human Nutrition, v. 66, n.2, p.129-135, 2011. SHAH, M. A.; DON-BOSCO, S. J.; MIR, S. A. Plant extracts as natural antioxidants in meat and meat products. Meat Science, v. 98, p. 21-33, 2014. USDA (National Nutrient Database for Standard). USDA.gov – United States Department of Agriculture. Available at: <https://ndb.nal.usda.gov/ndb/foods/show/2120?n1=%7BQv%3D1%7D&fgcd=&man=&lfacet=&count=&max=50&sort=default&qlookup=acerola&offset=&format=Full&new=&measureby=&Qv=1&ds=&qt=&qp=&qa=&qn=&q=&ing= >. Accessed on: March 9. 2017. ZORN, H.; CZERMAK, P. Biotechnology of Food and Feed Additives, Springer-Verlag Berlin Heidelberg, 2014, 301 p.